December 2017. Picture Prompt 1. The first picture prompt for December 2017. Welcome to the first picture prompt of the month, brought to you by the Imaginarium House. 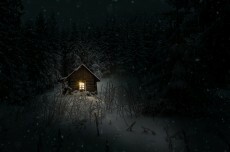 A cabin, isolated, in the snow. Is it a chosen isolation, an escape from the everyday, or sanctuary in a storm? Or is it something far more sinister? This could be used as inspiration for a multitude of genres. Don’t think too much, look at the picture and see what ideas pop up – then go with them! Use it as a prompt for a short story, or a poem. You could even make an essay out of it if you wished. This is not a competition, no winners or losers, just participants. Send me a message and I’ll guarantee you a read and comment. Better still, pop along to the Imaginarium House https://www.booksie.com/house-the-imaginarium-760 and if you like what you see, join us there. You do not need an invite and everyone is welcome from brand new Booksians to those who are much more established members. Hope to see some of you taking part. The most important thing is to have fun! This page was created in 0.4265 seconds.